One of the reasons I have always been so passionate about nutrition is that it is tied to everything in life. Even things that may seem to have nothing to do with food and nutrition, like rising rates ADHD, is in one way or another linked to diet and eating habits. Recently, I discussed a book, “Bringing Up Bébé,” with a friend. The book addresses the differences between French parenting and American parenting and cites lower incidences of ADHD there. We also discussed a recent article that shows a link between inadequate fat intake and ADHD in young boys. The article contains about 40 pages of overflowing medical terminology and statistics that I loved reading. Chief among the facts is that our brains are mainly made up of fat, which makes fat in our diet crucial to healthy brain development. In this study, they delved into the ratio and levels of Omega-6, which can be found in raw nuts, seeds, legumes and unsaturated vegetable oils such as sesame, and Omega-3, which can be found in deep-water fish/flaxseeds/walnuts/etc. They found that modern diets have revealed that “omega-6 to omega-3 ratios in dietary intake have risen from about 1:1 to 2:1 to 20:1”. This is important because another similar study reported that when “comparing 35 young adults males with ADHD with healthy controls, and found that the ADHD group had a higher total omega-6/omega-3 ratio”. So what does this all mean? Try to incorporate healthy sources of fats into your own and your children’s diet while making sure to eat a variety of food rather than just sticking to a couple sources of fat. Some healthy sources of fat are dairy products, flax seeds, chia seeds, olive oil, avocado, salmon, halibut, swordfish, walnuts, almonds, pistachios and many other foods! Incorporating fat into your diet will not make you fat if the portion size is correct. It is an important part of everyone’s diet and shouldn’t be feared! Stayed tuned for additional research to come out on this topic! Giving my child vitamin C supplements will prevent them from getting colds. Recent studies have shown that vitamin C supplementation is typically not effective for preventing colds. However, regular vitamin C supplementation prior to catching a cold may decrease the DURATION and SEVERITY of a cold. Studies show that the duration of a cold was 1-4 days less for those that regularly took a vitamin C supplement before catching a cold than for those that did not take a supplement. Vitamin D deficiency is prevalent among children and adolescents. Vitamin D is important for bone growth and immune function. Sunlight exposure is the best source, but it can also be found in fortified items such as milk, cereals, some brands of juice and yogurt, fatty fish such as salmon, tuna and mackerel, and eggs from hens that have been fed vitamin D.
An 8 oz. serving of milk contains 100IU. Sun exposure for 30 minutes twice a week without sunscreen. Sunscreen blocks the synthesis of vitamin D.
Snacking can help children and teens achieve a healthy weight. Ideally, snacks and meals should be timed so that they are eaten every 3-4 hours. Healthy snack choices include fruit, vegetables, cheese, nuts/nut butters, and hummus. Unplanned, continuous snacking can result in unhealthy weight gain. Don’t allow snacking during screen time which can lead to overeating. It’s okay to stop snacks one hour before meals so that kids are hungry at mealtimes. 100% juice has the same nutritional value as a piece of fruit. In addition to all of the vitamins and minerals found in 100% juice, a piece of fruit contains fiber, which fills you up faster and keeps you satisfied for a longer period of time. Fiber also helps relieve constipation. You will also find additional phytonutrients in the edible peels and seeds of a piece of fruit. It is recommended that children’s diets focus on whole fruits first. What is true regarding hydration in children and adolescent athletes? Water, not sports drinks, should be the main source of hydration. Routinely drinking sports drinks should be avoided or restricted because they can increase the risk of overweight and obesity. Sports drinks contain carbohydrates, minerals, electrolytes and flavoring, and are intended to replace water and electrolytes lost through sweating during exercise. Sports drinks, in combination with water, should be ingested during prolonged, vigorous physical activity that lasts for more than 60 minutes. All of the above answers are recommendations from the American Academy of Pediatrics. What is true regarding breakfast for children and teens? Children and teens who eat breakfast function better in school and have better eating habits overall. Breakfast breaks the overnight fast and replenishes glucose levels, and children’s brains use more glucose than adult brains. Regularly eating breakfast is associated with overweight and obesity. A 2008 study in the journal Pediatrics found that adolescents who ate breakfast daily had a lower body mass index than teens who never ate breakfast or only on occasion. Research suggests a breakfast that includes a source of protein and whole grains and is low in sugar and artificial additives improves concentration, comprehension, and memory recall in school-age children. We’ve been lucky so far in Chicago this winter, but with December here, cold and snow are sneaking into town. 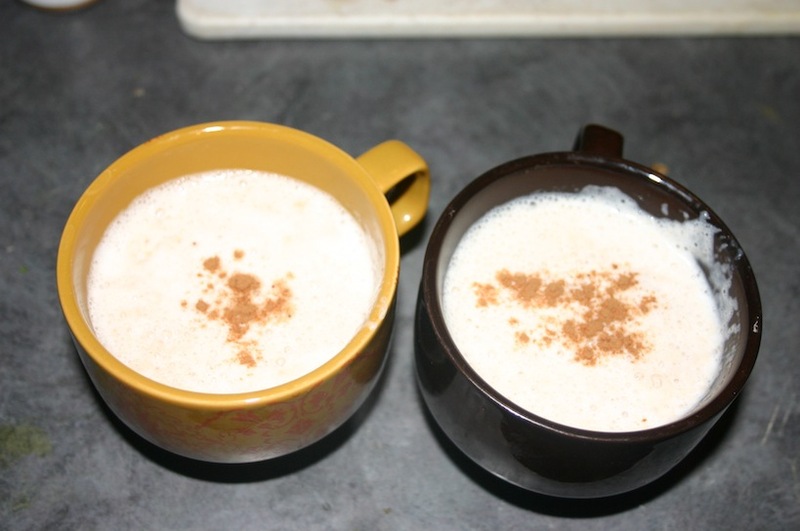 Try these hot drinks, perfect for kids and adults, to pull you through. Add all ingredients to a blender and blend for 3o seconds, until top is frothy. Drink immediately. Blend the banana and milk in a blender until smooth. Mix the cocoa powder, maple syrup and vanilla in separate bowl by hand. Add the chocolate mixture to the banana drink and blend until smooth. Pour mixture in mugs, leaving room for it to foam, and microwave one minute. Sprinkle cinnamon on top and enjoy. Heat milk in a sauce pot on medium heat for a few minutes without letting it boil. In a separate bowl, stir together cocoa powder, cinnamon, vanilla and syrup. Once milk is hot, stir chocolate mixture into the pot. dash cinnamon. If it’s bitter, add a little more syrup. Brew the tea for a long time, so it’s fairly hot. Heat the milk in a pot or microwave. Add milk, vanilla, honey or syrup, almond and cinnamon to a blender and blend a few minutes until frothy. 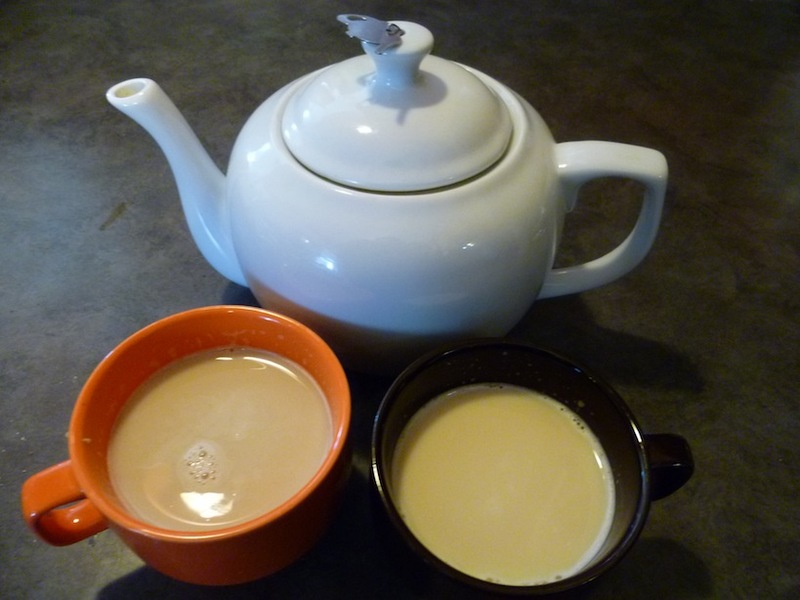 Stir the milk mixture into the tea and serve.